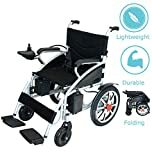 Unlike older day where you have to manually move the wheelchair with the power of your hands, or probably need some other person to move your wheelchair and take you to the desired location. It makes you greatly dependent on the other person. Thus, electric wheelchairs have been developed. With electric wheelchairs, you can have total independence with the ability to get around your home or anywhere without needing any second person. 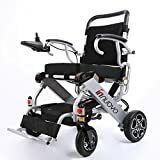 To help you out we thoroughly researched and selected the Top 10 Best Electric Wheelchairs In 2019 that are very reliable and comfortable for anyone. This basically is not a wheelchair but a compact power scooter. It is similar to a golf caddy without a roof, with easy to drive around the outdoor on rougher surfaces and ideal for daily use. If you are suffering from the minor problem in your legs, this might be the one to take you around easily, quickly and with a style. If you are looking for a simple looking electric wheelchair then this must be on your wishlist. It’s simple and easy to adapt design makes it an ideal wheelchair for anyone to get around their house with ease. It features a joystick to control its movements by simply rotating it back and forth similar to a game controller. Waterproof smart joystick with 360 degrees controlling along with indicator lights, horn, speedometer and power toggle switch. Are you the one who loves the Transformers movies and hold a dream of owning something that will define your love for these futuristic robots. The Force mech Power Wheelchair is exactly what you are looking for. The high tech futuristic design along with lucid color options will make you look like you are really riding a robot from transformers series. Its ultra-light chassis and foldable design make it ultra-reliable and easy to carry wherever you go. Impeccable for traveling in Airplane as well as the cruise. This foremach power wheelchair is the cousin of the voyager R2 that is ranked number 8 on our list. If you are looking for a simple yet powerful electric wheelchair then you should consider this wheelchair. It’s a combination of a robust metal chassis with a premium design. The seat is very well cushioned and provides a fairly comfortable riding experience. With one full charge it can go up to 16 miles, thanks to the flagship dual Li-ion batteries. 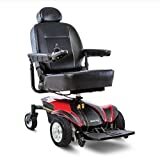 The Comfy Go Electric wheelchair really defines the company’s name and manage to provide a comfortable and easy to drive experience to the user. All the controlling is done via a 360-degree rotatable joystick along with various indicators and a power toggle button. The dual 24V motor provides a maximum speed of 4 miles per hour and swiftly glides through any type of surface. 8 Hours of charging will get you travel 13 miles nonstop with a maximum speed of 4 mph. Now travel with pride with this Pride Mobility Sports Electric wheelchair. The design in itself looks sporty and very comfortable. Made for those who need a fully functional and eye catch wheelchair. It’s cool looking design can easily make you the talk of the town. It’s powerful, comfortable, dashing and convenient, what else do you need! Another comfy electric wheelchair on our list, this time with a more punchier color to add joy to your life. All the Comfy branded wheelchairs have one thing in common and that’s the comfort they provide the user with its airy seat and practical design. It is based on sprayed steel foldable chassis design to make it compact and easier to carry around. This wheelchair grabbed the number 3 position on our list because of it’s simple and convenient design that allows the user to ride it both manually and remotely. This makes it a practical and usable even after the battery is discharged. It is made up of robust material with a white and black spray paint on the metal while the seat is done red making it look pleasing to the viewer’s eyes. The Innouva power chair is the most lightweight wheelchair on our list and weighs just 57 pounds. Apart from being lightweight, it features a sturdy tubular design with a full aluminum alloy construction. The seat is thick and cushiony that will provide you great comfort even using it for long hours in a day. Not a traditional wheelchair, this is a compact travel power scooter with the tri-wheel drive. It is more of a fun to ride focused vehicle and can be used by a person of any age. It’s great exterior design with interchangeable color panels adds a charm to its sporty looks. The added basket at the front makes it great for shopping personalities and it also gives the ability to attach a second basket at the back of the scooter to make it more expedient. A full charge will go 9 miles, thanks to its state of the art quick connect battery pack that charges quickly. Choose the wheel placement carefully, Front wheel drive for easy off roading, middle wheel drive for better rotation in minimal spaces and rear wheel drive for a good and stable ride. With abundant options to choose from, every electric wheelchair has a sole motive of transporting you from one place to another without the need of any other person. They provide you with a great level of independence and let you go wherever you want to be it outdoors or inside your home. Though every wheelchair has its own perks some are more powerful while some offer a trendy look. 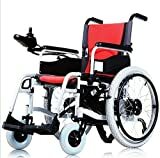 Keeping in mind each and every essential aspect we have selected the 10 BEST ELECTRIC WHEELCHAIRS that offers fun to ride experience without compromising on other features.